Aside from the black partscaster, I also have another MIM blacktop stratocaster. This is a Candy apple red. I’ve already did some work on it when I got it in March this year (2017). I replaced the nut (Graph Tech Black Tusq XL), bridge saddles (Gotho Stainles Steel) and Fender Locking Tuners. So it Sounds good, and plays amazing. But pickups are too hot for my (current taste) and now I find them rather muddy. I thougth on installing an EMG DG20 Loaded Pickguard, but although I love David Gilmour playing and sound, I don’t play like him, nor do want to sound like him, so I changed my mind about it. Besides, what’s the poing on buying the whole thing already made… where’s the fun in that? So the plan now is to make it a killer “vintage” strat…. for a reasonable price. After doing some research I arrived to the Seymour Duncan Antiquity Texas Hot Strat set. I really like the sound of these. They are available as a set or a preloaded pickguard (but we have already established that there’s no fun in that), so the set it is. I have already ordered it and should be here within the next two weeks. 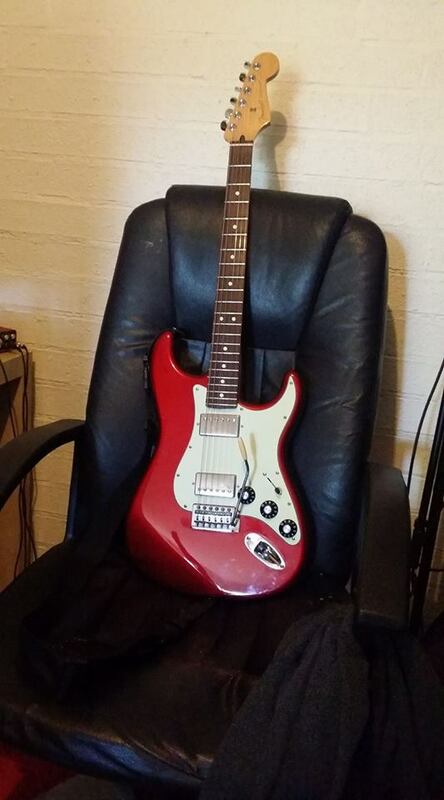 I already have a some of the required hardware (Fender SSS pickguard, actual vintage knobs)… and I’m yet to decide whether I’ll go for the classic strat setup, or go bit more custom and do away with the tone pots (either one or both), and (again) put a blower switch… as this really suits my playing. I will copper foil the guitar cavity and of course… quick disconnect features. Cap: modern strats use .047pf, but apparently 0.022pf would suit this better. or I could do something like this and have the possiblity to have both. This entry was posted in Hardware, Red Strat and tagged Antiquity Texas Hot, guitar modification, Partscaster, Stratocaster on October 25, 2017 by Andres Munoz.